José (Fernando Cardona) is a restaurant deliveryman. He cycles through the hectic streets of NYC, avoiding car doors, as he survives another day-in-day-out hustle. He returns home to an apartment shared by nearly a dozen others: undocumented Latino workers, all aiming for something better, and holding onto a promise of an American Dream that seems increasingly less possible with each passing day. It’s only on his day off on Sunday, i.e. the film’s title, that he’s able to indulge in his two faiths – church and soccer. And it’s here where Jim McKay’s En el Séptimo Día situates the conflict of his modest drama, where José’s humble living is presented with an existential battle between duty and happiness. The stakes may seem low, but when you have so little, the most minuscule of inconveniences end up resonating profoundly. The conflict, as it were, finds José having to work on his Sunday off. His boss, a demanding and ineffectual leader, threatens to fire anyone who doesn’t work a special event. This conflict coincides with a championship soccer game, with José serving as his team’s leader. When told of the news, at the start of the workweek, you can tell that José is absolutely devastated. The conversations between Jose and his boss are typically laced with an implicit sense of command – José’s undocumented status limits his bargaining power and as such, makes denying his boss impossible. This comes at a particularly delicate time where José’s attempting to move up within the restaurant’s undefined hierarchy as well as bringing his pregnant wife from Mexico to NYC. The decision to skip his soccer game should be simple, what with the costs and benefits of rejecting his boss’ demands jeopardizing his ambitions. But McKay wisely opts against making any critical judgments, instead maintaining the film’s stakes as a tender ode to the realities that upend our foremost wants and desires. 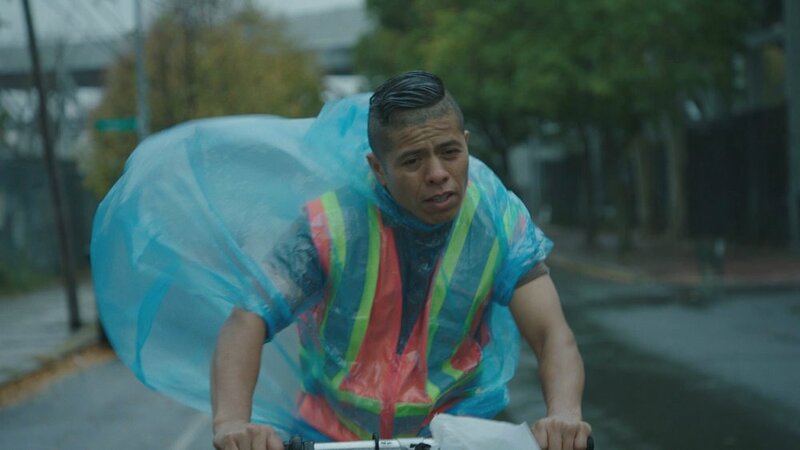 There’s something complex and compelling about how McKay observes José’s tired, worry-lined face as he cycles in the rain during a delivery. It’s a scene where we observe the character attempting to muster the energy to either let his team know that he won’t play the Sunday game or to plead with his boss to give him the day off, all as a steady drizzle makes cycling an unendurable slog. McKay’s framing, the way he cuts from a close-up of José to his movements through the neighborhood, speaks to a kind j-o-b crisis that, no matter what your status, registers as universal. Stories this modest and tender are vital reminders of our place in the world and to pause for a second to take stock of those moments that, miraculously, lead to our happiness.